Ask each patient to fill one out to capture 3 degrees of cancer history for both maternal and paternal family members. Emphasizing to your patients the importance of capturing a thorough family history will allow you to better evaluate their hereditary cancer risk and appropriateness for testing. Review your patient's Cancer Family History using consistent red flags to determine if your patient is at increased risk for hereditary cancers. Assessment criteria based on medical society guidelines. For these individual medical society guidelines, go to www.MyriadPro.com/guidelines. Family members include first-, second-, and third-degree blood relatives on both your mother’s and father’s sides. *Adenomatous type. ††Presence of tumor infiltrating lymphocytes, Crohn’s-like lymphocytic reaction, mucinous/signet-ring differentiation, or medullary growth pattern. 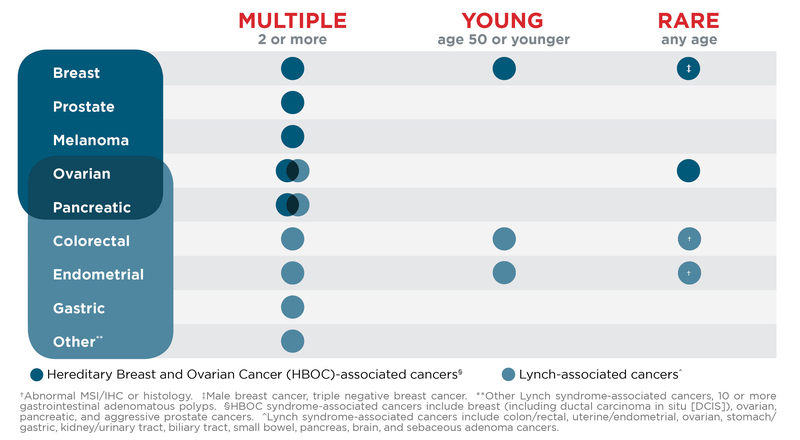 **For the most up-to-date general population, gene-associated cancer risks, management criteria, and other syndrome-related cancers not listed here refer to the Gene Tables located at https://www.MyriadPro.com/myRisk Risks are for patients who have never had cancer. Patients with hereditary risk may have increased risk for other syndrome related cancers. Myriad, the Myriad logo, Myriad myRisk and the Myriad myRisk logo are either trademarks or registered trademarks of Myriad Genetics, Inc. in the United States and other jurisdictions.